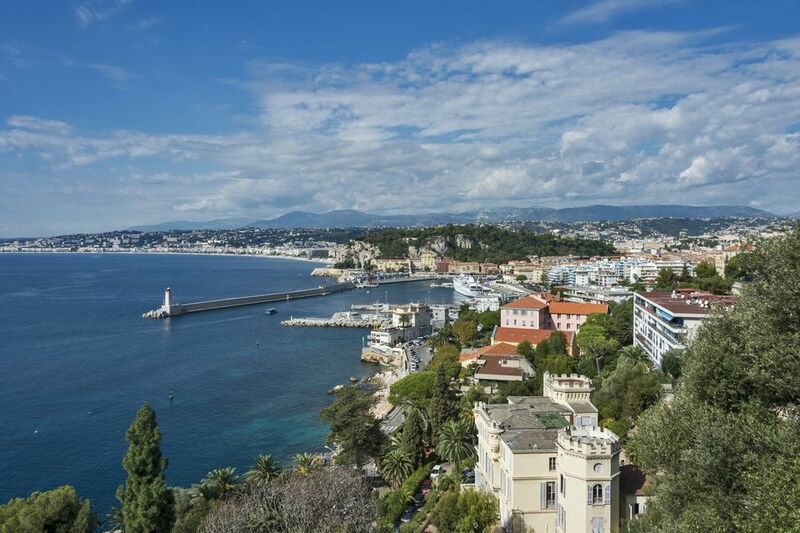 Back in Roman times, Nice served as the region’s capital—a role it maintains today as the gateway to the French Riviera. Once part of the Kingdom of Sardinia and a favorite for wealthy British aristocrats in the 18th century, Nice’s mixed upbringing is part of the city’s allure. Just one step along the seaside Promenade des Anglais (the Promenade of the English) and you’ll instantly see why this port town was—and still is—a jetset favorite and artist haven, enticing everyone from Matisse to Chagall (who both have museums in the city) with its renowned light and glittering turquoise seas. Skirting the shores of the sparkling blue Baie des Anges (the Bay of Angels), Nice’s famous Promenade des Anglais stretches 2.5 miles along the coast from the airport in the west to the Old Town and Quai des États-Unis in the east. Cyclists, skateboarders and rollerbladers cruise along the coastal stretch, which leads down to the pebble-filled plage, or beach. Dating back to the 18th century when the English would winter on the French Riviera, the promenade is the epitome of Belle Époque architecture—the most spectacular example being the five-star Le Negresco hotel. Featuring a collection of over 6,000 pieces of artwork (including a portrait of Louis XIV identical to the one exhibited in the Louvre), the haute hotel is an institution that has attracted everyone from Dali to Grand Dukes Vladimir and Dimitri. Sway to jazz music while sipping Champagne at the Old World-inspired, wood-covered bar or soak up the action further down the Promenade with a cocktail at one of two lively watering holes overlooking the sea: Waka and Movida. Vieux Nice, or the Old Town, is a maze of cobblestone streets forming the heart of the city—and Nice’s oldest still-standing neighborhood. Streetside cafés spill out onto squares dating back to the 17th century, such as the Place Rossetti with its Baroque Cathedral of Saint Reparata, inspired by Rome’s Santa Susanna. Perhaps a more iconic landmark is the square’s Fenocchio Glacier, a popular gelateria with 94 flavors to choose from. Once you’ve got your gelato in hand, continue your stroll up the nearby staircase leading to the Colline du Château, or Castle Hill, the city’s original site. The citadel was dismantled in 1706 by King Louis XIV’s troops, but the site today is known for views of the Old Town and Baie des Anges. If you would rather skip the stairs, take the quick ride to the top in the Art Deco lift sitting at the end of the Quai des États-Unis. For souvenir shopping, the Old Town is your best bet. Near the Opéra de Nice you’ll find a few local specialty shops nestled between souvenir shops selling typical trinkets like magnets and T-shirts. Get your olive oil fix at A L’Olivier, which originally opened in Paris’ Marais district back in 1822, or pick up more modern versions of Marseille’s iconic soap at Compagnie de Provence, which sells beautifully packaged lotions and creams in scents like lavender field and fig leaf. Across the street, you’ll also find one of the Old Town’s more modern bars, the tapas-themed El Merkado. Expect a wait on the weekends, but it’s worth it for the Serrano ham-filled croquettes. If this place is too packed for your taste, head to the bar-lined rue de la Préfecture and take a seat on the terrace of one of the hottest Mexican restaurants to open up in the city: La Lupita. If you’ve seen the classic Hitchcock film “To Catch a Thief,” the Cours Saleya market may look familiar. The main drag running through the Old Town opens up to a sprawling daily fruit and vegetable market from 6 a.m. to 1:30 p.m., but plan on arriving before noon if you want to get the best produce. Peruse the stalls sampling Corsican cheeses and charcuterie, pausing for a quick snack at the infamous socca stand, Chez Thérésa, where you can try this regional specialty (a chickpea flour crepe). For an insider’s insight to the market, book a tour with food writer Rosa Jackson’s Les Petits Farcis, where you’ll not only learn more about the local produce, you’ll also be able to sample your market finds with a rosé-fueled course back at her cooking studio. While the fruit and vegetable market finishes round lunchtime, the flower market—ranked one of the top in the country—sells bouquets and potted plants until later in the afternoon, packing up around 5:30 p.m. as the cafés and bistros start moving their tables on the terraces for apéritivo, or pre-dinner drinks. Take a seat and order a glass of vin (wine) at one of the brasseries like Le Flore, where you’ll often find jazz musicians serenading tables. If you’re in town on a Monday, an antique market takes over the Cours Saleya, with secondhand trinkets from trunks and tables to vintage Chanel jewelry and furs. Centrally located near the Place Garibaldi, the Carrera-marble covered Museum of Modern and Contemporary Art (MAMAC) features exhibits from pop art and new realism artists like Andy Warhol and Yves Klein, whose work you’ll find up on the rooftop terrace, which shows off panoramic views of the city. The 1,300-piece permanent collection showcases work from over 300 different artists. While the collection of pop art by the likes of Roy Lichtenstein and Claes Oldenburg is quite impressive, what really makes this museum stand out is the work from the School of Nice, conceptual artists who helped lead the modern art movement in the city back in the 1960s. While Castle Hill may offer a signature snapshot over Nice, the best views of the city lie further uphill in Cimiez, the regional capital when Romans ruled the area in 14 BC. You can still see remnants from the former Roman city of Cemenelum in the form of a small amphitheater, or arènes, and Roman baths dating back to the 3rd century. At the nearby Musée d’Archéologie, peruse artifacts from the ancient site, as well as objects from the first inhabitants of Nice, discovered in a 400,000-year-old site belonging to an elephant hunters’ camp. The area is also home to a small community of Franciscans friars, with a 15th-century monastery and sacred art-lined museum open to the public. The real treasure, however, lies in the Sainte-Marie des Anges church in the form of three masterpieces by Nice artist Louis Bréa. Just next door, you’ll notice another famous name—Henri Matisse—whose grave sits in the monastery’s cemetery. While you’re strolling around, head to the edge of the Italian-inspired monastery gardens (the monks’ former orchard and vegetable gardens) for picture-perfect views over the sea. Chagall opened up his namesake museum back in 1972 to showcase his 17-piece masterpiece: the “Biblical Message.” Tucked at the foot of the hill climbing up to Cimiez, the Marc Chagall museum houses the largest public collection of work by the artist, with over 400 paintings, drawings and pastels curated around Old Testament themes. Start by admiring a gallery of 12 oversized paintings portraying scenes from the first two books of the Old Testament, Genesis and Exodus, before stepping into a smaller hexagon-shaped space where you’ll find five red- and pink-hued canvases inspired by Solomon’s “Song of Songs.” Not only is the collection worth visiting, so is the space itself, set in the ruins of a turn-of-the-century villa, which Chagall revamped with mosaics and a stained glass-lined auditorium. In the late 19th century, the Boulevard de Cimiez took a posh turn with Belle Époque villas and hotels, such as the Excelsior Régina Palace (the one-time favorite of Queen Victoria), which served as a military hospital before falling out of fashion like many of the other faded beauties along the boulevard. Now these villas serve as some of the city’s most stunning museums, such as the Musée Matisse. Matisse lived in an apartment in the Cours Saleya before spending time in Cimiez. Set inside a 17th-century Genoese villa between the Roman arena and the excavations in Cimiez, the museum displays a collection of Matisse’s work running from the 1890s (when he produced "Nature Morte Aux Livres") to the later cut-outs from the early 1950s, some of the last created before his death. Visit another of the artist’s masterpieces in the nearby town of Vence, where Matisse spent four years designing the stained glass windows and ceramic artwork lining the walls of the Chapelle du Rosaire, or Rosary Chapel. A more family friendly version of Rio’s Carnival, the Nice Carnival is the highlight of the winter season—and one of the oldest and largest carnivals in the world. Dating back to the 13th century, the Nice Carnival now draws over 1 million visitors each year for the multi-week event, which typically takes place in late February or early March. Over 1,000 musicians and dancers perform alongside parades unfolding in the city center around Place Masséna. Parades of over 20 floats sporting oversized puppets (called grosses têtes, or big heads) make their way down the street as crowds dressed in costumes and masks throw confetti. While the neon light-filled evening parade is definitely a party, the daytime Bataille de Fleurs (Battle of the Flowers) is something unique to the Nice Carnival. Throughout the course of the festival, 100,000 freshly cut flowers—80 percent of which are local—are weaved on to whimsical floats, which performers pluck off and throw into the audience along the Promenade des Anglais. Louis Armstrong and Ella Fitzgerald were among the first headliners at the Nice Jazz Festival—the first jazz festival in the world. Now more than 70 years later, the event still reigns as one of the top annual attractions on the French Riviera, drawing big-name acts like The Roots and Dr. John. Over 30 bands play during the week-long event in mid-July, which takes place in the Place Masséna and seaside Théâtre de Verdure. Now in addition to official concerts, hundreds of “Jazz Off” fringe performances pop up in different neighborhoods all around town transforming Nice into a music-filled, open air party all month long. Nice may be a coastal city, but don’t expect white Caribbean sand. Over four miles of pebble-covered plages, or beaches, line Nice’s Baie des Anges. Staircases along the Promenade des Anglais divvy up the beaches by name, with public spots interspersed between private seasonal beach bars and restaurants, which open from April to October. Reserve a beach bed and umbrella at one of the more modern eateries, Le Galet, where you can spend the day in true Riviera fashion: sipping rosé on a sunbed by the sea. In the next town over, Villefranche-sur-Mer, a smaller bay boasts more beautiful shores, plus a restaurant and private beach by Nice transplant Déli Bo. One of the Riviera’s most popular hikes starts 20 minutes away down the coast in Eze, with a path leading up to the storybook-perfect medieval town hovering over the sea. For something quicker that’s more of a local secret, pack a pan bagnat (a Niçois salad-filled sandwich) and make your way to Coco Beach on the opposite side of the port from the Old Town. The path winds around the coastline over moon-like white rocks and wooden footbridges, with cliffside perches prime for picnicking along the sea. The hike only takes around 45 minutes, but if you’re up for more of a challenge, head up the staircase to Mont Boron and continue the seaside trek all the way to the next village, Villefranche-sur-Mer. On your way back, stop for a glass of rosé in a spot equally as scenic: Le Plongeoir, a restaurant sitting on a rock over the sea that was once housed in a fishing boat when it originally opened in the late 19th century. Marseille is birthplace of bouillabaisse fish stew and Aix-en-Provence crafts candied calissons. And while Nice may be known for its namesake salad, you’ll find plenty of other famous fare on menus throughout town. Of course seafood is a given (you are on the Mediterranean coast, after all), but the city also whips up specialties like street food fave socca (also known as farinata), as well as petits farcis (ground beef and rice-stuffed vegetables), pissaladière (a pizza-like onion tart) and a meat stew dubbed daube. Sample some of these dishes at a takeaway stand in the Old Town called Lou Pilha Leva or take a seat at local legend Chez Palmyre, an intimate bistro formerly run by a mother-daughter team with a daily changing menu based around regional recipes. Packed weeks in advance, this is one spot where you will want to call ahead to ensure you’ll have a table. When it comes to the best socca, most locals agree on Chez Pipo, whose brick-and-mortar restaurant sits tucked away on a side street behind the port.